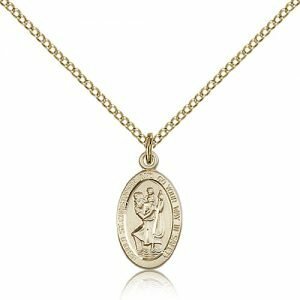 An important part of wearing a religious medal like a St. Christopher medal is how the person who wears it understands and relates to the saint portrayed on the medal. 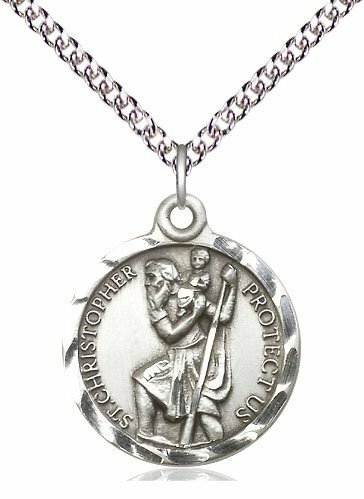 The question of what does a Christopher medal mean is fundamentally a question of how does St. Christopher connect to my activities, my challenges, and my life. 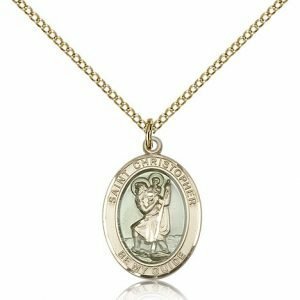 Let’s begin with the classic image of Saint Christopher, the one you most often see in artwork or on a religious medal. 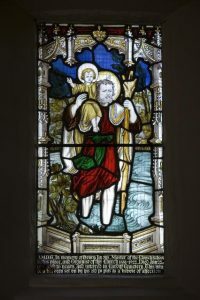 In it we have an image of a man, Christopher with a child on his shoulders standing in water. 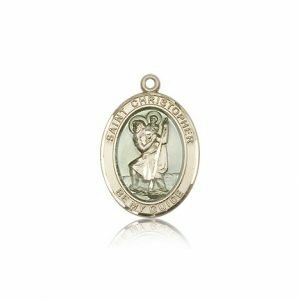 Each element of this image speaks to an aspect of his legend and gives us insight into the meaning related to any medal or image of St Christopher. Let’s look at each element. Christopher is typically depicted as a strong and rugged looking man with broad shoulders and a beard, This is related to his reputed work carrying people across a dangerous river. Often referred to as a giant he is not like other men when it comes to stature. His strength and size enable him to do what others could not. His is by all measures extraordinary. He is always shown standing; often he is standing amidst rushing water. Typically he is depicted holding a staff to keep him steady against the push of the water. While he is in the river it is rarely shown as very deep. One can safely assume most images are depicting St. Christopher walking out of the depths of the river and nearing the shore. He is pictured near the end of the challenge having overcome the hardest part, emerging safely on the other side. 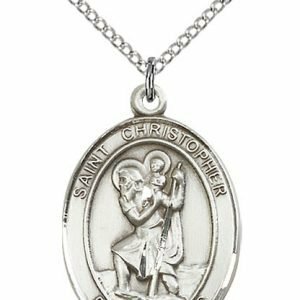 The core of the legend of St. Christopher centers around an extraordinary child. While the child by all appearances is a normal child, as Christopher carries the child across the river the child becomes unbearably heavy. 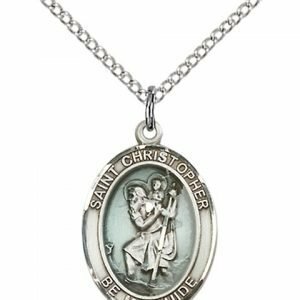 A hint to this cause is shown in many images of St. Christopher. In them you see that the child is holding what appears to be a small ball. This is a symbol for the world. 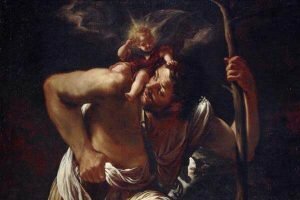 In turn the child, who is Jesus is carries not the world, but rather the sins of the world, an overwhelming weight for poor Christopher, but he bears up under it anyways. The river in the image represents danger, adversity or the threat of harm. in legend, the work of Christopher was to ferry people across a dangerous river by means of his own strength. It is a powerful image of advocate, helper and intercessor. As a result, many look to him to him for safety when they travel. The symbol of the river has a place in the Catholic Christian tradition. 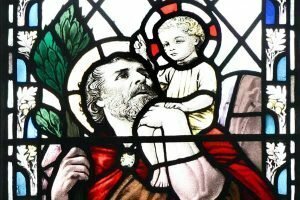 Consider the work of John the Baptist as portrayed in the Gospel. He preached a Gospel of repentance and baptized those who desired to turn away from sin in the river Jordan. His was a immersive baptism; dunking people completely into the water. It was a long way from the gentle pouring of water that is part of most Baptisms today. Both, do what they promise, but the baptism of John was literally an escape from death (unless you breath under water). As mentioned, according to legend, the work of St. Christopher was to help people cross a dangerous river. 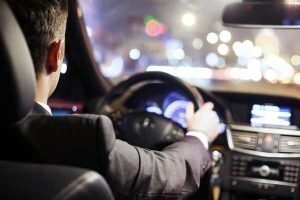 In that story Christopher is one who literally helps others pass safely through a danger. It is no wonder that he is the patron saint of travelers. In our modern age there are very few people who do not travel a meaningful distance each day. 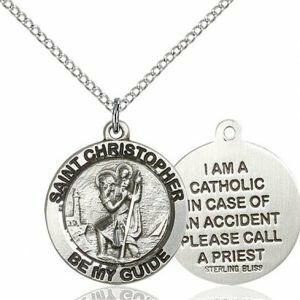 The popularity of St. Christopher is understandable. We all desire to arrive at our destinations safely. 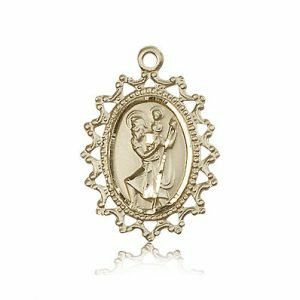 This is one of the reasons that St. Christopher Visor clips or Auto Rosaries care found in many vehicles. 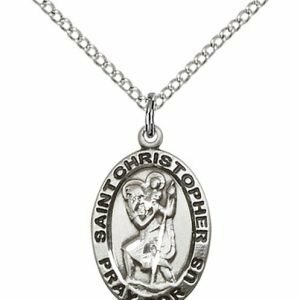 In addition you will often see St. Christopher associated with sports. 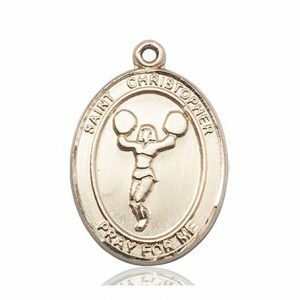 Many people who participate in sports have a Christopher medal. 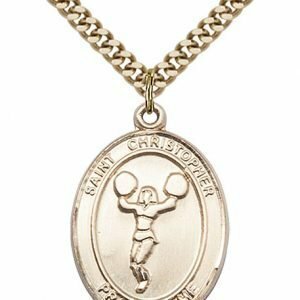 Even St. Sebastian is officially the patron saint of athletes, Christopher gets recognition here. Likely it is related to his legend of strength and his ability to past through adversity safety. The competition of many sports is physically challenging. This entry was posted in St Christopher Story. Bookmark the permalink.